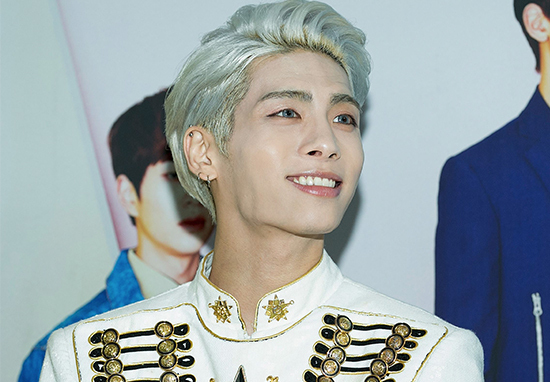 A note said to have been written by K-pop superstar Jonghyun has been posted online by his close friend revealing a desperate struggle with depression. Jonghyun was found dead on Monday in a suspected suicide, aged 27. He was one of five members of South Korean K-pop band SHINee, who have had a handful of number one hits. In a heartbreaking Instagram post published by his close friend and fellow singer, Nine, a member of pop group Dear Cloud, she explained how she’d been given instructions to make it public if Jonghyun ‘disappeared from the world’. The post explained how he’d struggled to cope with living in the public eye, saying: ‘I was broken from the inside’ and ‘the life of fame was never meant for me’. On Twitter, his fans have translated the message with some suggesting it was the singer’s last request to them. Heartbroken fans have been left saddened by the apparent suicide message and shared their thoughts on Twitter. And its soooooo heartbreaking that he had these thoughts. I’m so scared of the fact that most idols put on a smile & always try to help fans get over their personal issues but have also have these thoughts. OMG my heart is so heavy. And its soooooo heartbreaking that he had these thoughts ?. Im so scared of the fact that most idols put on a smile & always try to help fans get over their personal issues but have also have these thoughts. Omg my heart is so heavy ??? Reports suggest police first attended the apartment where Jonghyun was as a result of a phone call from his sister at 4.42pm on December 18. She allegedly thought Jonghyun had committed suicide as a result of a number of text messages which acted as a ‘last goodbye’. He arrived at the hospital after being found at 6.10pm Korea time. SHINee rose to prominence in 2008 in South Korea, and they also saw success in Japan. Earlier this year, SHINee released their fifth Japanese album Five, and toured extensively with the album across the country. The band have been named as the ‘Princes of K-pop’ due to their intricate dance routines and strong live vocal performances. At the weekend, a trailer was released for his appearance on JTBC reality show Night Goblin, which is set to air on Christmas Eve. If you or anyone you know need anybody to speak to someone in confidence please call Samaritans for 24/7 support on 116 123 for free.